Not long ago came the sad news that Peter Lehmann had passed away. The ‘Baron of Barossa’ was 82 and in declining health. But whenever one of the founding giants of the modern wine industry dies, there is an inevitable sense of loss, and a feeling, whether true or not, that we shall never see their like again. I never met Mr. Lehmann, but I’ve long admired the wines marketed under his namesake label. His career in wine spanned 65 years, from a start as a cellar rat at Yalumba, on through stints at Saltram and Dalgety, and finally into an entrepreneurial venture named Masterson Wines (named for the rascal protagonist of the musical Guys and Dolls). That turned into PLW – Peter Lehmann Wines – which was, and is, though not small, a winery run on the principles of a family-owned boutique. Since 2003 it has been part of the Hess Collection, and seems solidly anchored on its established, independent path, though with a clear eye on the future. There are, indeed, 140 growers in the Lehmann group, all independent, as the winery itself owns no vineyards. This past weekend I had the pleasure of welcoming Senior Winemaker Ian Hongell into my home, and he shared some excellent wines and a bit of the legacy left by his late employer. We tasted a couple of the lower-priced wines, including a crystal clear, springtime fresh 2011 Eden Valley Dry Riesling ($17); a spicy, focused blend of Semillon, Pinot Gris, Gewurztraminer, Muscat and Chardonnay called Layer ($17), and an entry level 2010 Portrait Shiraz ($17). The Layer was especially impressive, for its seamless melding of apple, melon, orange peel and mineral, with a distinctive saline finish. For a $17 Shiraz, the Portrait was outstanding, with lovely aromatics, a complex mix of dried fruits, and dashes of pepper and cacao. Though 60,000 cases are made, the wine does not lack for focus, detail or personality. A 2008 ‘8 Songs’ Shiraz ($35) followed, that Hongell described as “touching into the Barossa pedigree, with its inclusion of some older vines.” Though he did not go into detail, older vines in the Barossa can mean at least 50, and as much as 150 years of age. Great intensity, fine tannins, lush red currant fruit, and a combination of power, substance and density set this wine clearly several rungs up the quality ladder. Then the real fun began. The winery's top cuvée, a $90 Shiraz labeled Stonewell, was presented in two vintages, 2004 and 2006. Hongell noted they were two of the best vintages of recent decades. Not wishing to compete, but being the host, I pulled a 2004 Corliss Cabernet Franc and a 2006 Leonetti Cabernet from the cellar. We spent the rest of a peaceful evening contemplating what great wines are all about. I have never before had the Stonewell. So many things about the two wines were impressive. The compact power, the silky tannins, the density and detail of the flavors. “These are not single vineyard wines,” Hongell noted, and went on the explain that he ferments all but the very smallest lots from the 140 growers separately, and each year the best of them – 20 or so – are given the opportunity to become part of that vintage’s Stonewell. The rewards are financial as well as bragging rights – Stonewell components are paid a substantial premium. What was most fascinating was his account of the five day exercise in which each of the separate lots are evaluated. Briefly, they are tasted by a panel over five successive days, and only those that are still fresh and flavorful after all that time are considered for the final blend. This certainly accounts for the fact that both of these bottles were tasting superb on the second day (pictured above) and if I can keep my hands off them I’ll revisit them on day three as well. I'd say day four is a long shot – and not due to any failing of the wine. The two Washington wines were excellent examples of both winery and grape, but did not initially have the seamless expressiveness of the Stonewells. I would guess that this is mostly a function of vine age. The old vine Shiraz simply gives the winemaker more subtle flavors to work with, and Hongell and his team know how to make them shine. The Leo and the Corliss wines, both still quite delicious on day two, had what I can only describe as young vine flavors – bright, juicy, well-proportioned, but not quite as complex, and with tannins not quite as silky smooth. And yes, of course, they were not Syrahs. The purpose was not to go head to head, just to compare, contrast, discuss, and learn. I think we all did. 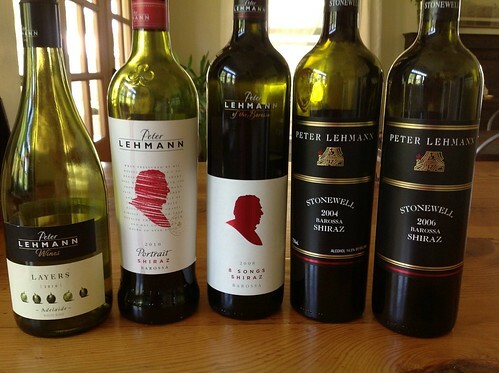 Where The Heart Is, and for more on all the wines and the people behind them, visit Peter Lehmann Wines. The full Decanter obit may be found here.